Phalaenopsis orchids are one of the most common orchids. You find them in larger grocery stores, big discount stores and the big box home improvement stores. Fully blooming plants can bring fairly steep price tags of twenty to thirty dollars or more. Five or six months ago, I accidentally found a way to get some economical phalaenopsis orchids for as little as two bucks a plant, including a nice pot. Gardening On A Dime style, I was walking around my local Lowe’s garden department, looking for deals. I headed straight to the racks with all the reject plants. If you have ever visited these racks, you’ll know what I mean when I say that these plants are in bad shape. Most are on their last legs and their prices let you know that no one has any value on them. On this particular visit, nothing worth saving was left on the almost bare racks. However, I remembered seeing right outside the garden center entrance, an employee was filling up a rack with orchids. (phalaenopsis orchids, according to the tags) All of these plants were past their peak blooms. Most had wilted leaves and bare flower stalks sticking up in the air. They were in nice pots and priced from two to five dollars. I knew it was time to find a cart. I guess now would be the time to tell you that we have never had much luck with orchids. One or two here and there have surprised us with flowers. A couple that we had thrown under some trees and forgot about surprised us once with bright purple blooms sticking out from under other shade loving plants in the bed. But for the most part, we would get them, hope for the best and then watch them wither. So, as I stood in front of the rack, I remembered my experiences with orchids. But for two bucks? And already planted in a nice pot. I told myself that the pots were worth what each plant would cost me….like we need more pots. I spent a good thirty seconds rationalizing to myself all the reasons why I should put a few in my cart. And, that is exactly what I did. I took them home and put them on our ” extra care” plant rack. The “extra care” plant rack is a bench we have that gets a mix of the right amount of sun and shade. Some might be recovering from who knows what. Some are waiting to be re-potted. Some of our more unusual or rare plants are on this rack to watch them grow and notice immediately if they need a little “extra care”. 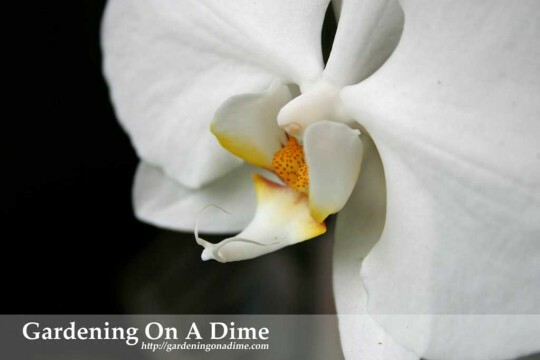 Our Gardening On A Dime economical orchids found a new home. Unfortunately, while adjusting to their new home, they were slowly pushed to the back of the rack as newer plants were placed in the front. Which was ok since the orchids were doing what they usually do for us……nothing. Yes, a little regular water plumped up the wilted leaves. Yes, they even sprouted a couple of new leaves. But, for the most part, they just existed, like they were waiting for something. Fast forward to a few weeks ago. Two of the orchids pushed up a flower spike. Within a week each had a single bud. And a week later, a flower on each plant. That’s when I decided to find out what these orchids like in order to grow healthy and bloom. And, I thought that some of you might also be wondering what needs to be done to take good care of orchids. Light… Don’t scorch them in direct sunlight. Phalaenopsis do better in low light. Indoors near an east window or a shaded west or south window will work fine. Hang them in a shaded corner of a gazebo or under a canopy of trees and watch them bloom outdoors. We keep ours on a table in the gazebo and on a rack under an orange tree. Both locations seem to be working ok.
Water… Correct watering is important to phalaenopsis. The plant medium should never be allowed to dry out completely. Nor should the plant be allowed to soak in water for any length of time. Outdoors, during the dry seasons, I give ours a drink every day or so. Like a lot of our outdoor plants, I water the orchids when they are barely moist (or whenever the plants around them get a shower from the hose). Mother Nature takes over the task of watering as the summer rains arrive. However, as the summer temperatures rise and the humidity climbs, your orchid will need more air flow around it. Fungus and disease can set in if the air is too stagnant. Believe me, I think I’ve lost a few phalaenopsis in the heat of the summer because of little air circulation and too much moisture. We know gardeners that bring their flowering orchids inside once they start blooming. Their advice for indoor orchids is to add two or three ice cubes to the pot once a week. That will be enough moisture to keep the blooms opening. If you keep them inside year round, the humidity needs to be between 50% and 80%. During dry winter month (indoor humidity below 40%), it helps to keep the pots on a tray of gravel that has been partially filled with water. Fertilizer… The one thing we always neglect. For those of you who CAN get on a regular plant feeding schedule,, use any of the basic 20-20-20 water soluble fertilizers like Peters or Miracle-Gro. And, as with a lot of indoors plants that are used outside, feed them regularly during the warm growing season and back off on the food as temperatures cool off in the fall and winter. Growing Medium… They call it “orchid mix” for a reason. We keep a couple of small bags in the shed just in case any of the bargain orchids we’ve picked actually survive our “get use to the heat” environment. We’ve purchased plants potted in traditional orchid mix, bark, sphagnum moss or some sort of perlite, charcoal mix. The main thing is to plant in a very light mixture with good drainage. Temperature… They say that phalaenopsis should not be grown in temperatures above 95°. We push that window a lot during the summer and the orchids survive. Ideally, they like the low seventy to mid eighty range. Indoors, they can adapt to average mid sixties to low seventies temps. If grown outdoors, night time temps in the fifties will induce flower spikes. Those kind of cool spring nights are what bring on the show. But be careful about changing your orchids surrounding temperature (inside – outside – inside – outside). Changing environmental temps too quickly can cause bud drop. That’s one reason that I leave ours alone if they are doing alright. I’ve had too many plants drop all of their leaves or buds because I was trying to make conditions better by moving them to another location too quickly. Don’t give them too much light. Keep them moist but not wet. Give them a drink of fertilizer on a regular basis. Don’t let them boil in the heat or freeze in the cold. And don’t keep moving them looking for that perfect spot! You get to enjoy relatively low maintenance plants with nice large strappy leaves, multiple flowers stalks and up to twenty blooms per stalk. 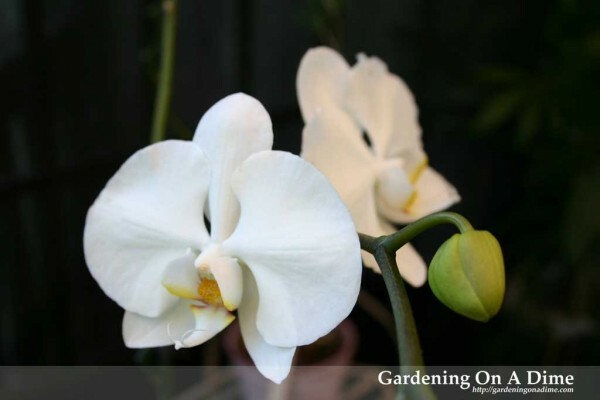 Growing phalaenopsis orchids can be pretty basic. You can buy them show ready and in full bloom. We may not have seen twenty blooms per spike, but every flower was worth the minimal effort required from us. As it turned out, we have had about a dozen blooms on the peach colored orchid. And even though the white one only gave us five or six flowers on one stalk, it also branched out with a second spike and opened another half a dozen flowers. And, yes it is true, these flowers can last from three to four months! One final tip: After the blooms have stopped, you can sometimes induce more spikes by snipping back the spike at a point just above the third node (or notch) from the bottom. Many times, a new “branch” will sprout just below the spot that you pruned, giving you another round of flowers. 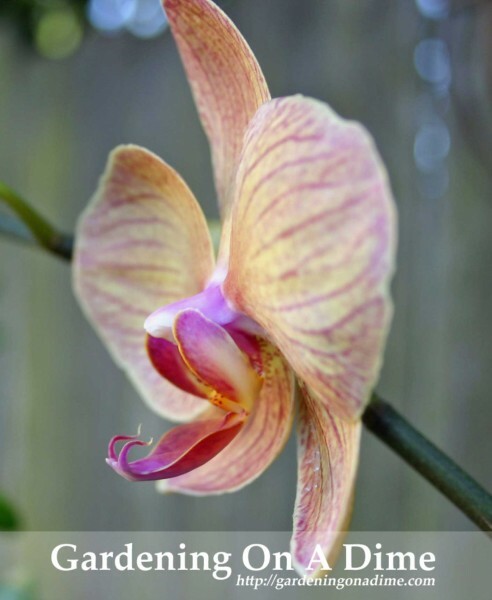 Sources: Gardening Friends, the School of Life,and the American Orchid Society. Lowe’s plus Joann’s….sounds like more than enough reasons to make a short day trip for some bargains and more. Thanks for you comments. Moth orchids don’t like being dry to the stage that they begin to wilt. They need to be watered completely and then not again till the media is almost, however, not entirely, dried out. 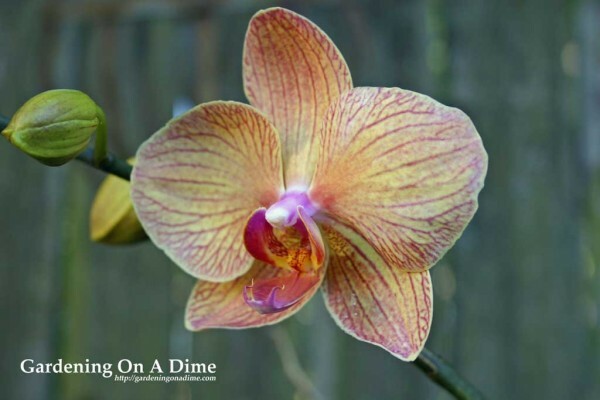 You ought to water your orchid in the morning hours and allow all of the water to empty out from the bottom. I put mine on an old dish rack for a couple of hours before I put them back to the window sill. How frequently you water is determined by the kind of media your orchid is growing in as well as its growing environment. Once weekly to 10 days is an effective starting place. In winter months, with the heat on in your household, lower humidity means you will certainly need to water more often. Do not allow your plants to dry out to the stage of wilting. It is going to truly set them back. Do not get any water on the flowers as this will reduce their longevity. Good Advise. I like the dish rack idea. Thanks for the input. Your orchids are gorgeous–and it’s so cool that you found them on the sale rack and were able to nurse them back to health. Thanks! It’s a good feeling to help them back to health. Thanks for the comment. The Lowes discount shelves are a win-win! Whether it be orchids or annuals! Those shelves are the reason I always park in front of the garden entrance. Thanks for the comment.